Nassau Bahamas and neighboring island Paradise Island are home to some of the world’s best fishing, whether that be offshore sport fishing, reef fishing, or even flats fishing, Nassau Bahamas is a top destination for anglers of all persuasions. 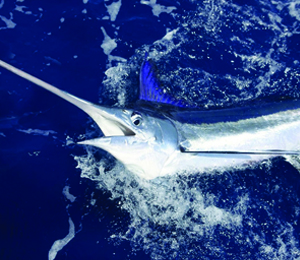 Here at Fish in the Bahamas, our passion is fishing in the Bahamas. We work diligently to provide only the best, most affordable, and most successful fishing charters anywhere in the Bahamas! With the 48-foot Chris Craft fishing vessel, the Born Free IV, we offer our guests one of the most spacious and luxurious vessels available for Nassau fishing. This 48-foot fishing vessel is a luxury yacht that can hold up to 20 people! That is a lot of space for a boat. We typically suggest no more than 8 for a fishing charter, to make sure everyone on board has the opportunity to take part in the world-class fishing available here. The Born Free IV comes fully equipped with all necessary fishing gear and equipment including fighting chairs and top-quality Penn International rods and reels. The boat comes with two bathrooms, a galley, a large private stateroom, and a spacious deck that is great for lounging and even sunbathing. The best part about fishing in the Bahamas is that the conditions are great year-round! The waters are typically calm and the weather is always tropical. The Bahamas also offers a great amount of diversity in its fishing, so if the conditions are not so good at one location, we just go to the next. The team behind the Born Free IV has decades of experience fishing in the waters of the Bahamas. Whether you are going on a half day charter or a full day, you can rest assured that this team will be doing everything possible to make sure you experience the most successful and enjoyable Bahamas fishing trip possible. We do provide bottled waters as well as a cooler full of ice. You are welcome to bring any additional beverages or snacks as long as they are not in glass containers. I have been to the Bahamas many times, but The Born Free IV - 48' Chris Craft is one of my favorite trips! It includes everything that everyone should do here. As a Bahamas veteran, I can say only the best about this experience!